Who is “the little red-haired girl”? Well aside from being Charlie Brown’s favorite obsession, it’s one of several affectionate nicknames for my beautiful wife. And yes, she does have red hair. She’s also my editor. I kinda got the whole package. The book I’m currently working on (and yes I’m getting back to it shortly) is Surreality, a noir/technological murder mystery due to release sometime in the first half of this year. What does “DM” stand for and what is it? DM stands for Dark Matter and is the working title of another book in the pipeline, a science-fiction action adventure story. I finished the rough draft of this in 2011 at 200K words, though I plan to significantly rewrite it when I have the opportunity. Dark Matter is the working title in part because as it turns out there are a number of books and even a video game or two with that title, so I will likely change it, but maybe not. Well, for starters my masthead is a fractal. Your brain is a fractal. Every tree is a fractal. It’s all fractals man! 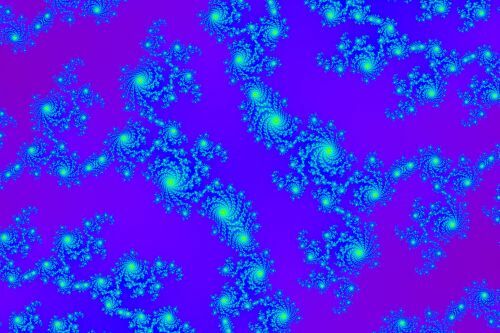 A lot of you came to my site from this post, so you may at least have an idea or curiosity about fractals. Fractals can be used to model nature, or create mathematical art. It’s the art bit I probably like the most, and drawing them is a fun programming challenge (probably why I wrote a book about it 🙂 ). True-bee. NOT Troob. Trube or not trube. Beards cannot be measured only in inches (or feet) but in the memories they carry. So about 7 inches from my chin to the tip. A Game Forever Voyaging was a brief recurring feature in the first year of the blog. Due to a reduced interest and the amount of work that tended to go into each post these are on semi-permanent hiatus. Getting old games to work on modern systems is still a favorite hobby of mine, and if something particularly interesting comes along I might share it (or if you have any requests). I still do quite a bit of technical posts, but these tend to center more on the creation and formatting of eBooks, which is a little more germane to my self-publishing audience. The Consumers for Fariness in Manufacturing and Labor was another early hallmark of the blog, and one I’m proud of. I still think from time to time about the ways to think about where our products come from and what we can do to encourage fair wages for those who make them. It’s a complex problem and one that needs highlighting so you may see me back in this space again. You can still read all the posts here. What’s up with all the acronyms BTW? I live in Columbus, OH. I work in Delaware, OH. Both are at about the middle of the state (Columbus is the capital). My state is spelled O-H-I-O! Who’s this Brian person I keep hearing about? Don’t bother with him, he’s bad news. Actually he’s my good friend and fellow writer (and occasional anime fakesub partner). He blogs over at BrianDBuckley.com. Do you do guest posts? Maybe, but realistically probably not. I’d like to sometime, but each writing year only seems to get busier with projects. Absolutely, in fact if you have any more questions and want to write them in the comments, I might just answer them.